There’s been a lot of talk in the publishing world this week about the advantages and potential disadvantages of signing with a small press. For those of you who aren’t as familiar with the publishing world, a “small press” means any company that isn’t part of the Big 5–Harper Collins, Penguin Putnam, Random House, Simon & Schuster, and Time Warner. Some have gone so far as to suggest that in today’s environment, where self-publishing is such a readily available option, there’s no point in signing with a small press. A main character who remains likeable even at her worst. Mel becomes quite the diva about two-thirds of the way through the book. She’s hot, she’s famous, and she is oh, so much more than a mere funeral singer. But the reader can still root for her because Mel also is vulnerable. And that, my friends, is because my editor, Amy Garvey, pointed out ways I could make her vulnerable even at her worst. Had I self-published, I would not have had that editorial guidance and the story would not be as strong. Its gorgeous cover. Have I told you how much I love the cover? Not sure what would have happened had I self-pubbed. I’m not a designer, so I would have had to hire one. Would he or she have come up with something equally as striking? Perhaps. But one thing is for sure: I would be poorer right now. Cool promos. 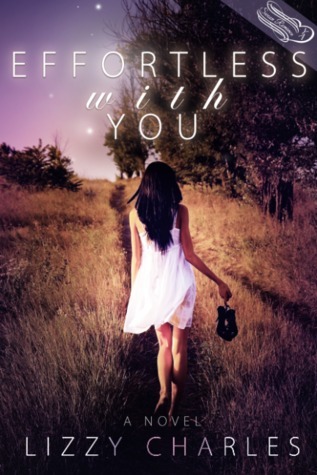 Such as having my first chapter published at the end of Lizzy Charles’ EFFORTLESS WITH YOU. A lot of people are reading Lizzy’s book. Within the first 24 hours of its release, it ranked within the top 2,000 books in the Kindle store and within the top 100 “coming of age books” within all of Amazon. As of this posting, it is all the way up to #69 in that category. That promotion, along with the mention of my book on USA Today’s romance blog, my cover reveal, and the blog tour that is scheduled upon the release of my book on September 24, are all publicity efforts I could not have achieved on my own. The support of an amazing publishing family. I daresay this is something Swoon offers that not even the Big 5 can top. Its listserve is so full of author encouragement and advice, some days I worry that my inbox might explode. A new manuscript that is about a third finished. I hit 18,000 words this week on my next book, meaning I’m about a third of the way through. No way would that have happened if I had decided to self-publish THE FUNERAL SINGER and had to deal with formatting it, hiring a cover designer, placing it on Amazon, doing all my own promotion, etc., etc. Having a publisher behind me to do all that allows me to do what I most want to do: write! Please don’t get me wrong. I am not saying there is anything wrong with self-publishing. Many people are doing it and doing it well. Nor am I saying signing with a small press always offers advantages. Some small presses offer better services and better distribution than others. The key is to know what you’re getting into and to make an educated decision. For THE FUNERAL SINGER, signing with Swoon Romance was a marriage made in heaven. And that’s why I said “yes” to the (small) press. There you have it … THE FUNERAL SINGER in one compact little cloud! 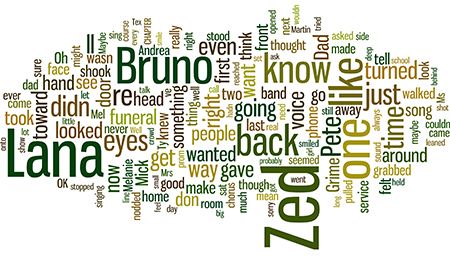 Thanks to the magic of Wordle, we can see which words appear the most in my book. Perhaps the thing that most pleased me when I pasted my manuscript into Wordle’s cloud-formation machine and hit “Go” was seeing that the word “just” didn’t appear in 400-point font, dwarfing all the other words. We all have our crutch words, and “just” is certainly mine. I have to work hard to avoid overusing it. What’s your crutch word? Not sure? Try pasting your work into Wordle to find out!